Hi all! Here's a card I made for the latest MFTWSC373 challenge. I used one of my favorite flower sets, Funky Flowers, along with a sentiment from Geometric Greenery. I created the background using Copic markers and added texture using the blending solution ala Kathy Racoosin. Yes, I was totally trying to channel her especially since I was fortunate enough to attend one of her Color Challenge Classes recently! The flowers were also colored with Copics, a bit of colored pencils and accented with a white gel pen. Hi all! Happy Hump Day! It's time for a new challenge on The Card Concept Challenge Blog! The new inspiration pic is soooo purty! I used some Lil Inker Designs stamps and dies this time. The Sketched Floral stamps were stamped onto Grout Gray card stock. I used chocolate brown and pretty in pink inks for them and highlighted the flower centers with white gel pen. The sentiment is also from that set. The coffee image and coffee die are from the Latte Love set. Hi all! 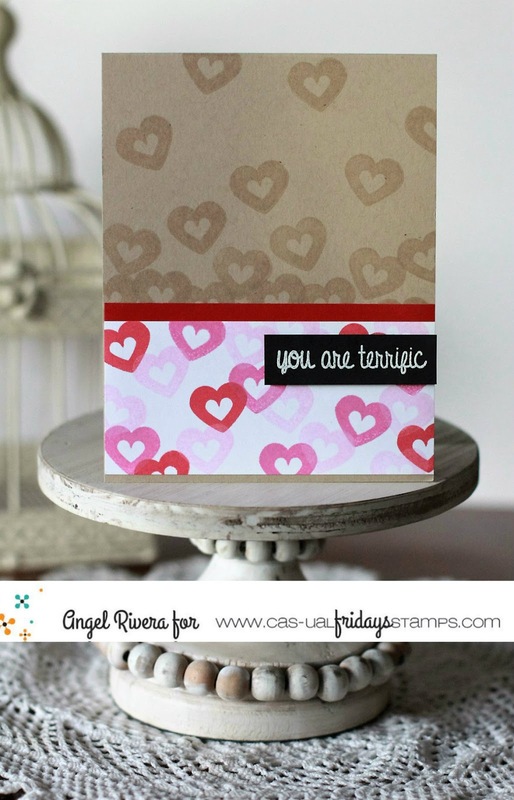 It's that time again - check out the latest CAS-ual Fridays Challenge HERE. I have always loved a good sketch challenge! I embossed one of the flowers from the Pretty Posies set on watercolor paper then colored them with my Zig Clean Color Pens. Be sure to play along for your chance to WIN! Hi all! There was a post by MFT guest designer, Rachel, that inspired me to finally step out of my comfort zone and try a different type of card. This one may be called a standing pop up card, but I'm not sure. It was SO fun to make! I'll need more practice on these because this one is not perfect but I love it regardless :) I used the MFT Town Bear stamp set, along with a sentiment from the Grateful sentiment set. The 'road' was created by using an element from an older Blueprints die set. I used a few inks and the Cloud stencil for the sky. All images were colored with Copics. Hi all! It's time for a new challenge on The Card Concept Challenge Blog. The inspiration pic is so pretty and girly! I used the MFT More Rustic Flowers set to stamp flowers to create the background. The sentiment is from the Handwritten Happiness stamp set. I used a few MFT die-namics for the sentiment and background layers. And to make it even more 'girly', I added some clear sequins. We hope you'll play along with us! Hi all! Here's my take on the MFTWSC370 sketch challenge. I sponged some black licorice cardstock with a few different Ranger Distress Oxide inks, then gold embossed the Floral Fantasy BG stamp over it. The sentiment is from the Bitty Bears set. Hi all! Happy Friday and welcome to a new CAS-Ual Fridays Inspiration Challenge! The challenge is all about hearts, so I used the heart from the new Peace, Love and Coffee set and stamped it in various colors. The sentiment is from the Pretty Posies set.